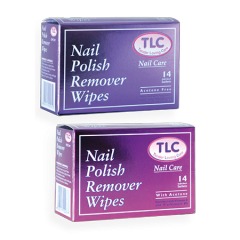 TLC Nail Care features a selection of quality nail polish removers to remove all traces of nail polish quickly and effectively. Lanonin and Vitamin extracts strengthen and cares for the nails, and exctracts of Lavender, Rose and Lemon provide a pleasant fresh fragance. © 2019 TLC International - Hygienic, Cosmetic, Baby & Health Care Products (Pty) Ltd | All rights reserved.